Today the church is regularly used for Christian worship and plays an important part in village life. The parish church of St Peter and Paul lies in attractive countryside about a mile south of the main area of Boughton village. 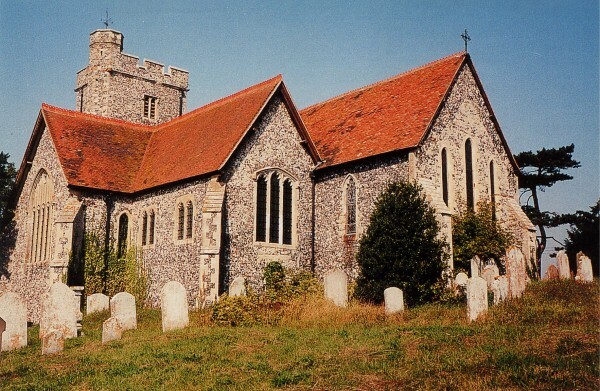 Boughton under Blean is mentioned in the Domesday Book; both church and manor belonged to the Archbishop of Canterbury. The village included a number of manors and hamlets, one of which was at South Street, which consists of a group of attractive houses and farms clustered around the church and spread along one of the pilgrims routes to Canterbury. The church is linked to Boughton by a well-used pathway still known as the coffin track and other footpaths continue on to the south. Archbishop Lanfranc may have built the original church on this site, but the present 13th century church would have been the one seen by Chaucer's pilgrims as they stopped at "Boughton under Blee". Several of the South Street farmhouses are at least 15th or 16th century in origin, including Boughton Court Farmhouse, near the church, formerly the chief manor of Boughton. The church dates from the 13th century with chapels being added in the 14th century and the aisles and tower in the 15th. The Grade I medieval parish church is of the highest quality in terms of its architecture. One of the best views is as you mount the steep hill from South Street. Much surrounding countryside is still used for traditional hop-growing. There are substantial historic houses nearby including Nash Court and Colkins whose families had strong associations with the church. A 16th century timber screen separates the nave from the chancel and a 15th century timber screen separates the north aisle from the north chapel. A similar ancient screen separates the south aisle from the south chapel. On the north wall is a tiny broken staircase which gave access to the rood loft over the screen, but this was destroyed by Victorian restorers, along with the 17th century box pews. The three-bay nave arcades, two-bay chancel and north chapel display typically Early English features, while the later tower with its west window and door, which is the main entrance, are Perpendicular. The building contains a number of wall-mounted monuments and memorials, in particular the fine collection, mostly 17th century, in the north chapel, which is also known as the Hawkins Chapel. The Chapel contains a fine monument to Thomas Hawkins and his wife, of Nash Court, by Epiphanius Evesham. The large and steeply sloping churchyard contains a number of monuments and headstones of interest, and some fine trees. The largest of the yew trees, by the south door, has been traced back to its donation in 1695. ME13 9NB. Each of the M2 London, A2 Faversham or Canterbury, A299 Ramsgate lead to the M2/J7 roundabout known as Brenley Corner. At this roundabout exit south onto Brenley Lane and proceed to the T junction. Turn left and then stay on this road for about half a mile - the church is on top of the hill with a car park just beyond.